She was one of the world’s most famous faces, yet no one knew who she was. Her sea green eyes are filled with tragedy. They challenge us and we cannot look away. She is called “the Afghan Mona Lisa.” And then she disappeared for two decades. 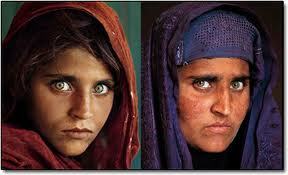 After searching the remote areas of Afghanistan for 17 years, “the Afghan Girl”, Sharbat Gula has been found. Orphaned at 6 years old when Soviet bombs destroyed her village and killed her parents, Sharbat Gula’s grandmother led her and her siblings across a treacherous mountain range, begging for food and hiding in caves, eventually reaching a Pakistan refugee camp. There, when she was 12 years old, Steve McCurry, National Geographic photographer, spontaneously took the photograph of the little refugee with the piercing green eyes. This image became the most recognized photograph in the history of National Geographic magazine. Now 30 years old, Sharbat Gula lives the traditional life of a veiled Muslim woman…but a Muslim woman living in poverty in a remote village. She can write her name but cannot read, was married at 15, has 3 daughters and her husband earns $1 a day as a bakers assistant. Sharbat Gula has had her photograph taken twice in her life, once in 1985 and again in 2002 when McCurry and National Geographic “found” her. The men in her family gave their permission to capture her image unveiled, again for the cover of the magazine. National Geographic sponsors The Afghan Children’s Fund for the education of Afghan youth. Watch this fascinating video of the search for the Afghan Girl. “Afgan Girl”. Kirby, outstanding. McCurry, well credentialed before his photographic creation of an icon, has now recaptured her down the road of life. Technology has certified her identity, but the current photograf reveals a different image. Is it “…the rose is off the bloom.” No. It is a pictoral story of the trials of life. One is tempted to believe it is unique result of a war torn victim of the Afgan debacle. I think it is a mindful and visual display of the process of life compounded by war. I am upset that National Geographic made so much money off of her face, and left her in poverty like this. I believe McCurry should have asked his magazine to do more. A school for her village–a chance for her children? Would someone come to a US or Western city, just snapped someone’s face like that–and gone on??? Life is not Eurocentric and neither is art. Sorry, But I feel very strongly abt this. it is in Political Economy from the Univ of PA. I am originally from Burma, and also a writer, novelist, poet, visual artist, playwright, radio broadcaster, political analyst. Thank you for raising the issue of helping Afghan girls or others through her story. I did a little research and was delighted to see a fund was set up for this purpose.